Bowie State defeats Livingstone and moves on to the CIAA Semis. 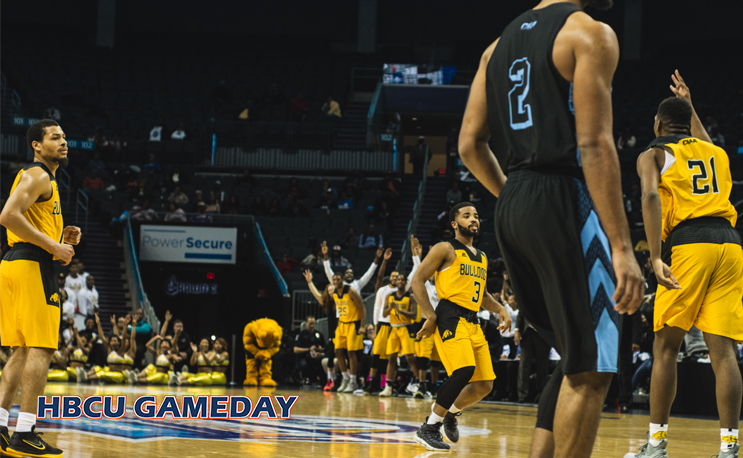 Charlotte, N.C – On Thursday night, Bowie State battled in a tough Quarterfinal CIAA Tournament game against Livingstone College and prevailed in the end, winning 80-77. BSU advances to the Semifinals of the tournament held Friday evening, where they will compete against Johnson C. Smith University for a chance to go back to the Championship game. Livingstone had a good hold on the pace of the start of the game with an 8-2 start. Bowie retaliated with a 15-5 run, and Rashard Todd of the responded with a 3-pointer to put the Blue Bears back within one point. Bowie then went on another run of 13 points to Livingstone’s 4 points, giving Bowie the 34-24 lead. With under four minutes remaining in the first half, Livingstone scored seven unanswered points to make it a three-point trail, 39-36. Bowie State’s Omari George ended the Blue Bears’ run with a layup, and a free throw from Jacob Long sent the Bulldogs into the half with the lead, 42-36. With just over 12 minutes remaining in regulation, the Bulldogs gained their biggest lead of the night over the Blue Bears with a layup from Yohance Flemming, putting Bowie up 55-44. Livingstone was not down and out, however, coming back to life with the 14-2 run. The Blue Bears narrowly regained control of the game over the Bulldogs, 58-57 with 8:35 remaining. With the help of six made free throws, Bowie State regained the lead 65-61 with six minutes remaining. The addition of a three-point dagger from Cameron Hayes along with three made shots at the line from Ahmaad Wilson pushed the lead for the Bulldogs to 75-67 with 1:47 remaining. A 3-pointer from Cameron Burhannon of Livingstone made it a five-point game, and two pairs of free throws cut the deficit to two points, 79-77, with 21 seconds remaining. Wilson made one of two free throws for the Bulldogs with three seconds remaining, putting them up 80-77, and securing the win following an unsuccessful shot attempt from the Blue Bears. Livingstone’s Cameron Burhannon finished the game with 22 points, and Omari George of Bowie led all scorers in the game with 27 points. Johnson C. Smith and Bowie State met once during the regular season and JCSU was victorious, winning 82-65.